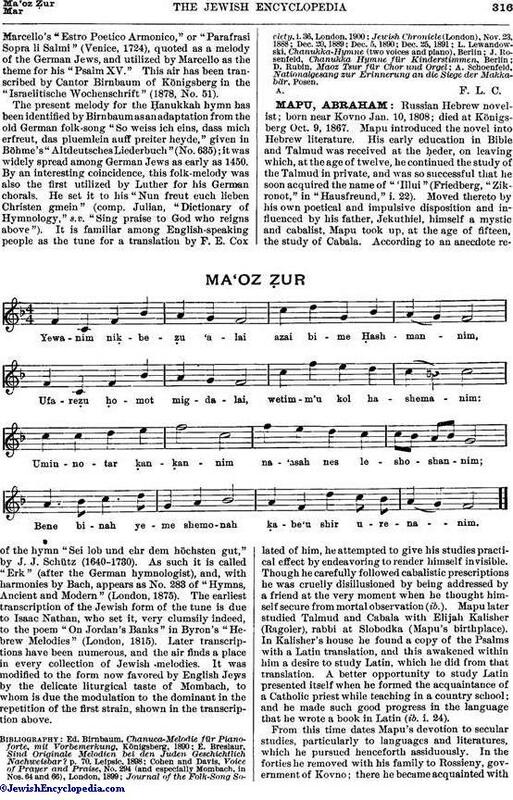 Commencement of the hymn originally sung only in the domestic circle, but now used also in the synagogue, after the kindling of the lights on the Feast of Dedication (Ḥanukkah). The acrostic signature is that of Mordecai. Zunz ("Literaturgesch." p. 580) is inclined to place the author of this hymn in the middle of the thirteenth century. He may have been the Mordecai ben Isaac ha-Levi who wrote the Sabbath table-hymn "Mah Yafit" (Majufes), or even the scholar referred to in Tos. to Niddah 36a. Or, to judge from the appeal in the closing verse, now generally suppressed, he may have been the Mordecai whose father-in-law was martyred at Mayence in 1096. The present melody for the Ḥanukkah hymn has been identified by Birnbaum as an adaptation from the old German folk-song "So weiss ich eins, dass mich erfreut, das pluemlein auff preiter heyde," given in Böhme's "Altdeutsches Liederbuch" (No. 635); it was widely spread among German Jews as early as 1450. By an interesting coincidence, this folk-melody was also the first utilized by Luther for his German chorals. He set it to his "Nun freut euch lieben Christen gmein" (comp. Julian, "Dictionary of Hymnology," s. v. "Sing praise to God who reigns above"). It is familiar among English-speaking people as the tune for a translation by F. E. Cox of the hymn "Sei lob und ehr dem höchsten gut," by J. J. Schütz (1640-1730). As such it is called "Erk" (after the German hymnologist), and, with harmonies by Bach, appears as No. 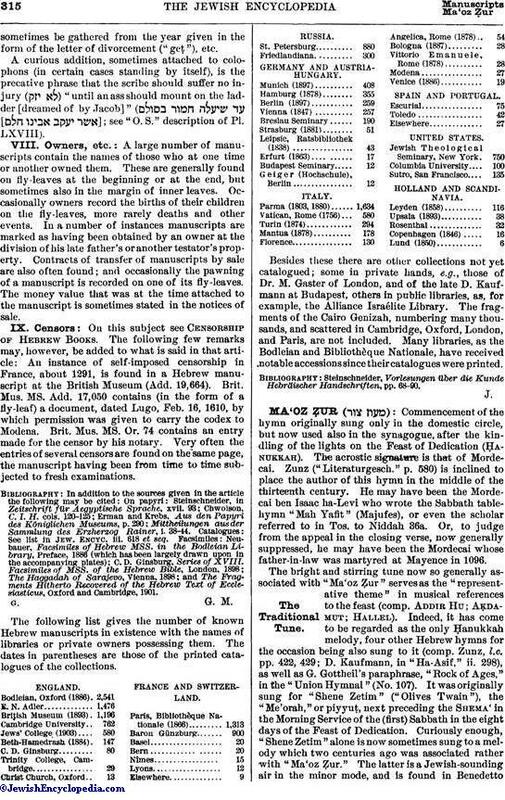 283 of "Hymns, Ancient and Modern" (London, 1875). The earliest transcription of the Jewish form of the tune is due to Isaac Nathan, who set it, very clumsily indeed, to the poem "On Jordan's Banks" in Byron's "Hebrew Melodies" (London, 1815). Later transcriptions have been numerous, and the air finds a place in every collection of Jewish melodies. It was modified to the form now favored by English Jews by the delicate liturgical taste of Mombach, to whom is due the modulation to the dominant in the repetition of the first strain, shown in the transcription above. A. Schoenfeld, Nationalgesang zur Erinnerung an die Siege der Makkabär, Posen.